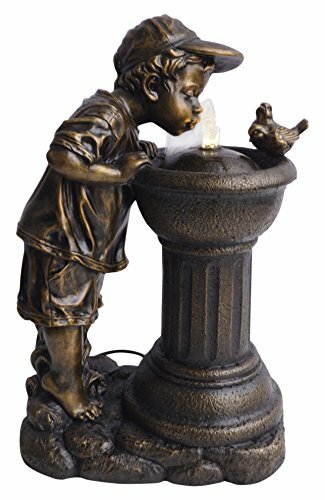 Alpine Corporation Golden Boy Drinking Water Out of Fountain with LED Light | Fountain City Art Ctr. This fountain features a Boy having a drink of water with a bird perched at the edge. Charmingly too short for the drinking fountain, the Boy gets on the tip of his toes to reach. Lovingly crafted from a polyresin & fiberglass mixture & painted in a gold finish. Zenvida Stone Cascading Waterfall Outdoor Garden Fountain 32"